Whey Protein Isolate, Citric Acid, Natural Flavor, Blueberry Powder, Soy Lecithin, Sucralose, Acesulfame Potassium, Carmine Color. Mix 1 scoop of FRUIT BLAST per 8 ounces (250ml) of water. Use more or less water to reach desired taste. The best-tasting protein also mixes with a spoon. 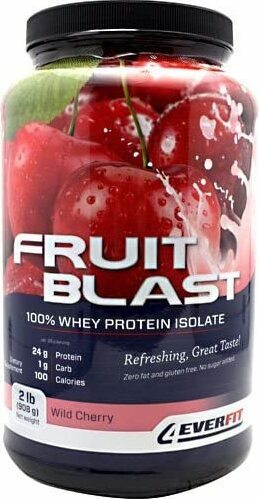 Mix 1 or 2 scoops of FRUIT BLAST the Isolate with cold water to make a delicious and refreshing protein drink. Use milk or juice to create a thicker smoothie-style drink. FRUIT BLAST is completely soluble, so there's no need for a blender or any messy clean-up. Scoop, mix and enjoy! Who knew staying fit could taste this good! Use this product as a food supplement only. Do not use for weight reduction. Keep out of direct sunlight and store in a cool, dark place. Whey Protein Isolate, Natural and Artificial Black Tea and Lemon Flavors, Citric Acid, Soy Lecithin, Sucralose, Acesulfame Potassium. Mix one scoop of FRUIT BLAST in 8 ounces (250ml) of water. Use more or less water to reach desired taste. Whey Protein Isolate, Citric Acid, Natural and Artificial flavors, Soy Lecithin, Sucralose, Acesulfame Potassium. Mix 1 scoop of FRUIT BLAST in 8oz(250ml) of water. Use more or less water to reach desired taste. Fruit Blast The Isolate delivers one of the highest Branch Chain Amino Acid (BCAA) profiles and is rapidly absorbed for powerful and effective lean muscle gain. * Each serving contains ZERO trans fat and no added carbohydrates. It's ideal for any low-carb diet plan. Fruit Blast The Isolate provides optimal nutrient utilization with none of the digestive system discomfort that can be caused by lower-quality proteins. * Low in calories and lactose, Fruit Blast The Isolate should be appropriate for anyone with milk allergies. One of the best-tasting proteins also mixes with a spoon. Mix one or two scoops of Fruit Blast The Isolate with cold water to make a delicious and refreshing protein drink. Use milk or juice to create a thicker smoothie-style drink. Fruit Blast The Isolate is completely soluble, so there's no need for a blender or any messy clean-up. Scoop, mix and enjoy! Who knew staying fit could taste this good?